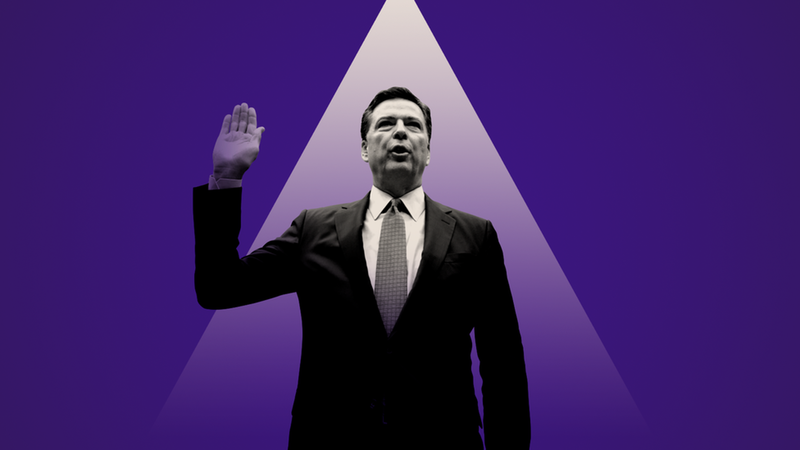 Jim Comey's cinematic opening statement, describing his awkward encounters with President Trump in vivid detail that you almost never get from inside government, foretells gripping testimony when the fired FBI director goes before Capitol Hill cameras at 10 a.m. ET today. MSNBC's Lawrence O'Donnell pointed out that any actor would want to act it, and any director would want to direct it. Comey's pre-released testimony, about a Jan 27 dinner in the White House Green Room: "[T]he President said, 'I need loyalty, I expect loyalty.' I didn't move, speak, or change my facial expression in any way during the awkward silence that followed. We simply looked at each other in silence." For all the cable-news talk of smoking guns, top Republicans were authentically relieved by what they read in the afternoon bombshell. Read between the lines, and you see Trump's transactional side — trying to make a distraction go away, like you would in business. The problem of course, is that he's no longer just running a family business: Corner-cutting and interference doesn't work in the Oval. The rapier reporting by The New York Times' Michael Schmidt was perfectly borne out. Putting aside the astonishing atmospherics, the facts of Comey's account are what we expected, but not much more. The key passage, when Comey says Trump "called me at the FBI" on March 30: "He said he had nothing to do with Russia, had not been involved with hookers in Russia, and had always assumed he was being recorded when in Russia. He asked what we could do to 'lift the cloud.'" Brookings senior fellow Benjamin Wittes, a friend of Comey's and editor-in-chief of the Lawfare blog, posted one of the best deconstructions of the statement, calling the Trump scenes "poisonous stuff ... conduct that a society committed to the rule of law simply cannot accept in a president." But Wittes also writes: "Let's leave to another day whether anything the President did here amounts to any kind of obstruction of justice." A top Republican close to the White House said the statement "shows Trump is relentless and unconcerned with Presidential behavioral conventions, which are two of the characteristics that won him votes." Republicans, though, need to recognize what they're defending: actions that show little respect or understanding for the lines and limits that safeguard rule of law. This isn't normal. Be smart: The road ahead is long. Comey's statement is captivating, but not grounds for impeachment. The threshold for any action is much higher than many think, because Republicans alone will set it.